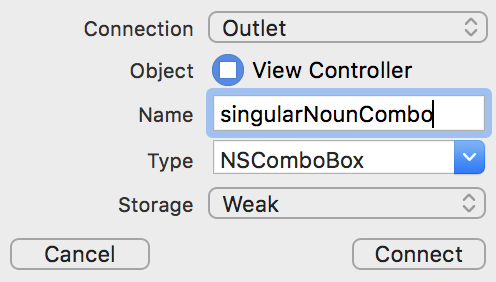 Learn how to use common macOS UI controls like NSTextField, NSComboBox, NSButton, and more in this two-part series — updated for Xcode 8.2 and Swift 3! Update Note: Updated for Xcode 8.2 / Swift 3 by Ernesto García. 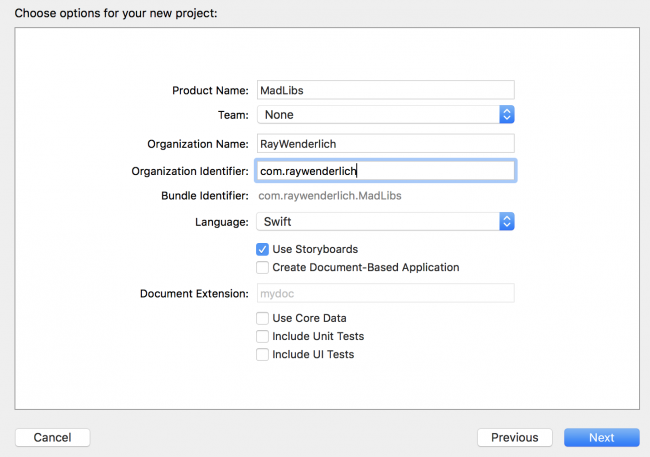 Previous update to Xcode 6.3 / Swift 1.2 by Michael Briscoe. Original post by Ernesto García. If you’re an iOS developer and you’re interested in learning about Mac development, you’re in luck – with your iOS skills, you’ll find it quite easy to learn! Many of the Cocoa classes and design patterns you know and love like strings, dictionaries and delegates have direct equivalents in Mac development. You’ll feel right at home! However, one big difference with macOS development are there are different controls. Gone are UIButton and UITextField – instead there are similar (but slightly different) variants. 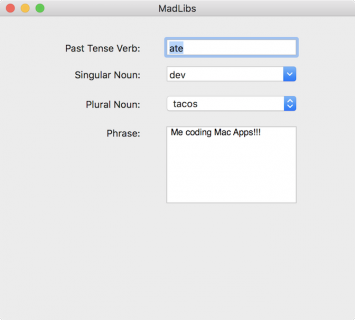 In this tutorial, you’ll be creating a simple Mac application like the popular game Mad Libs. 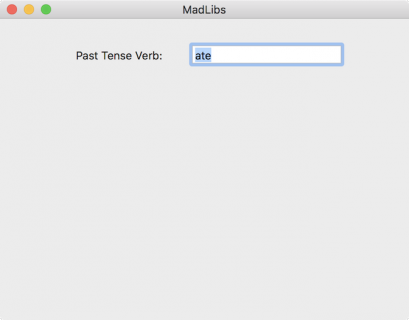 Mad Libs is a word game where you can insert different words in a block of text in order to create a story — which often has hilarious results! Note: Following this tutorial requires some knowledge of macOS development. If this is the first time you’re developing for macOS, you may want to go through our macOS Development Tutorial for Beginners series to learn the basics. 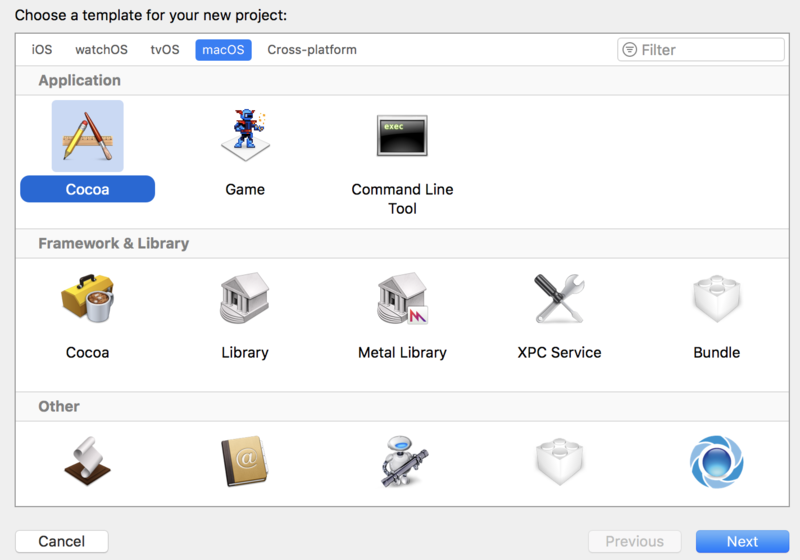 Open Xcode, and choose File/New/Project. In the Choose a template dialog, select macOS/Application/Cocoa, which is the template you use to create an app with a GUI on macOS. Then click Next. In the next screen, type MadLibs as the product name, and enter a unique Organization name and identifier. Make sure that Use Storyboards is checked and Swift is the selected language. Click Next and choose the location where you’d like to save your new project. Click Create. Open Main.storyboard. 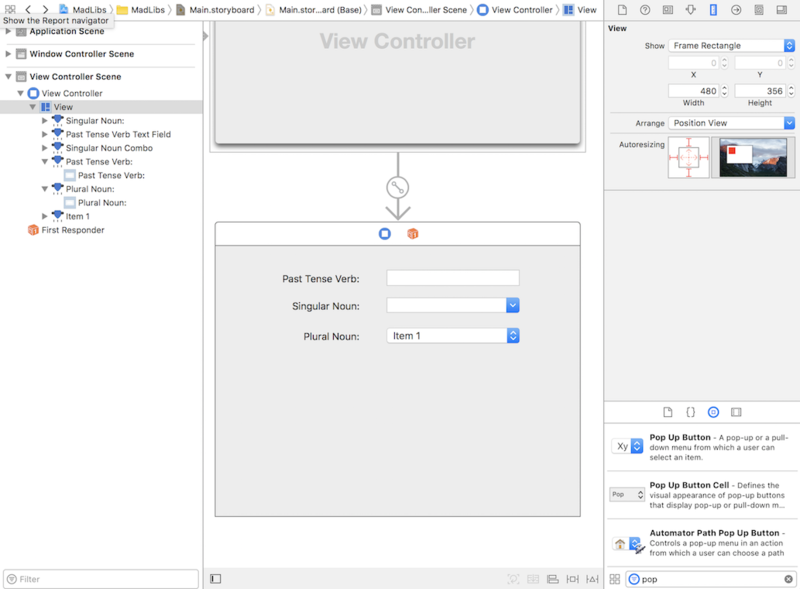 Xcode has created for you the basic skeleton of a macOS app: a Window controller and a content View controller. Select the window in the Window Controller Scene and open the Attributes Inspector. Change the window Title to MadLibs. A macOS app usually has a resizable window and its content has to adapt to the window size. The best tool for that is Auto Layout. To add Auto Layout to all the controls in this tutorial would create a major distraction; we want you to focus strictly on the macOS controls. Accordingly, only the default autoresizing is applied, which means that all controls will maintain a fixed position and size, regardless of any window resizing the user performs — including the possibility that some of the controls fully or partially will be out of the window’s visible rectangle. 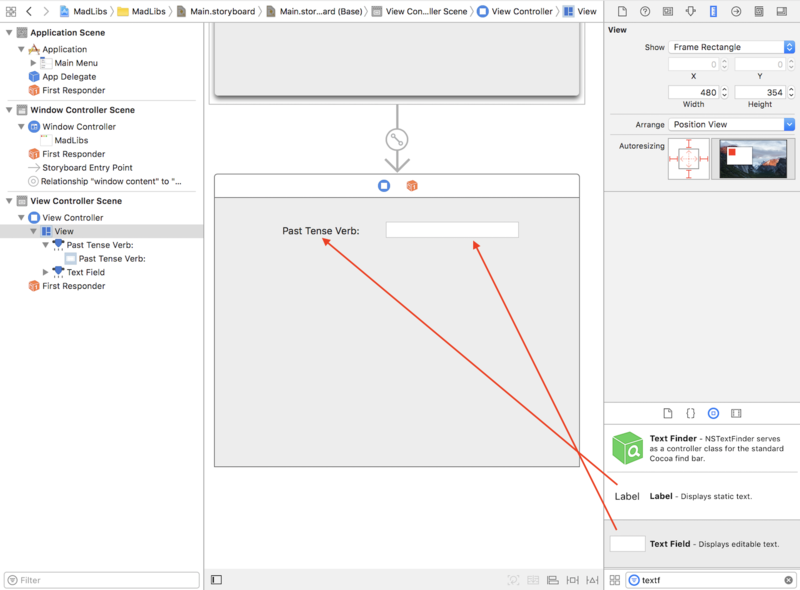 Note: If you want to learn more about Auto Layout and how to use it in your macOS apps, you can follow our macOS Development Tutorial for Beginners, Part 3. During the tutorial, you’ll need to add some macOS controls to this view, and the default height may not be enough to fit them all. 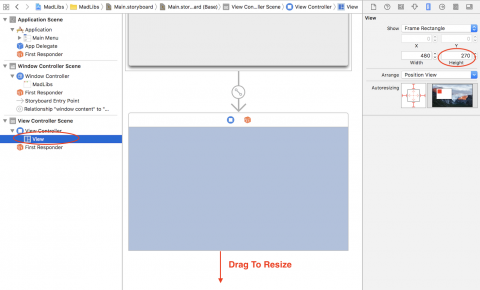 If you need to resize it, drag down the bottom edge of the content view, or set the view’s Height property in the Size Inspector. Now that the basic framework has been laid down, you can move on to the main focus of this tutorial — adding macOS controls to your app. Each of the remaining steps in this tutorial will focus on a single, different control. You’ll learn the basics of each control and how to use each one in the MadLibs app to try it out. 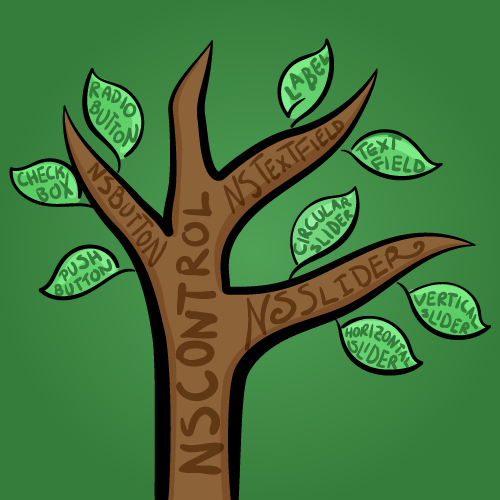 NSControl is the foundation upon which all other macOS controls are built. 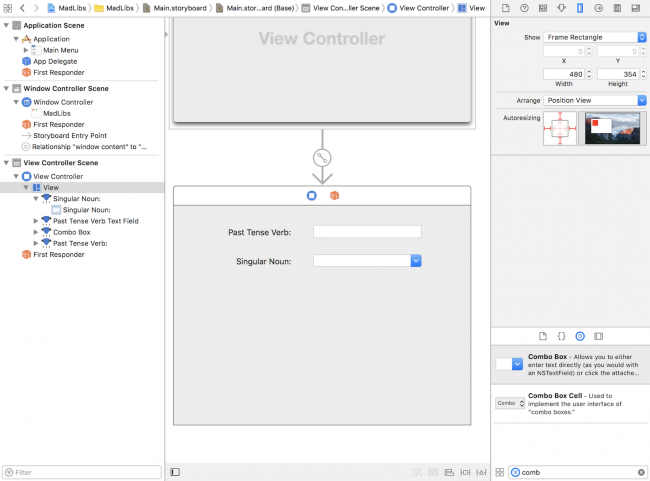 NSControl provides three features which are pretty fundamental for user interface elements: drawing on the screen, responding to user events, and sending action messages. 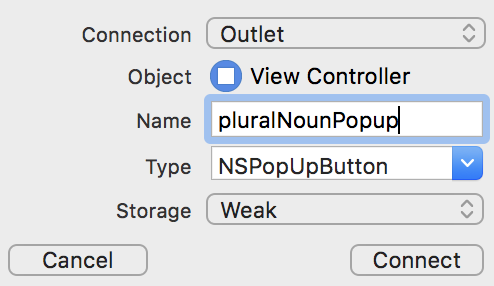 As NSControl is an abstract superclass, it’s entirely possible that you’ll never need to use it directly within your own apps unless you want to create your own custom macOS controls. All of the common controls are descendants of NSControl, and therefore inherit the properties and methods defined in that. If you need to display information you’ll usually change the control’s value. Depending on your needs, the value can be a string, a number or even an object. 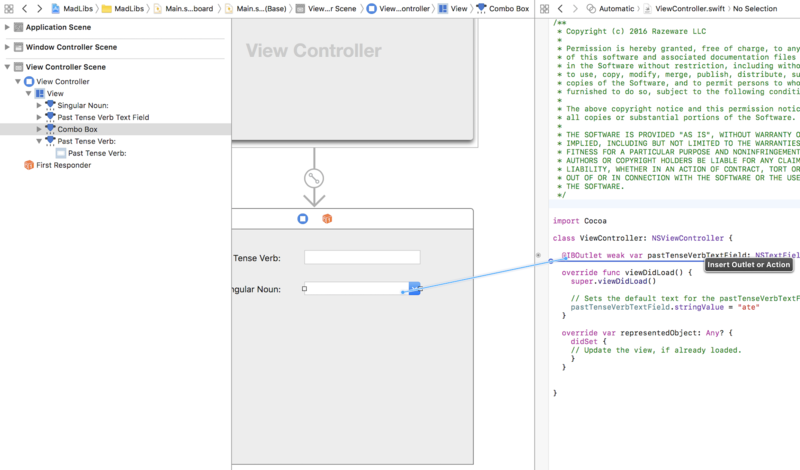 In most circumstances, you’ll use a value which matches the type of information being displayed, but NSControl allows you to go beyond this and set several different value types! You can see how the different setters and getters fit with the type-safety of Swift. Enabling or disabling macOS controls based on the state of an app is a very common UI task. When a control is disabled, it will not respond to mouse and keyboard events, and will usually update its graphical representation to provide some visual cues that it is disabled, such as drawing itself in a lighter “greyed out” color. Okay, that seems pretty easy — and the great thing is that these methods are common to all macOS controls. They’ll all work the same way for any control you use in your UI. Now it’s time to take a look at the more common macOS Controls. One of the most common controls in any UI is a field that can be used to display or edit text. 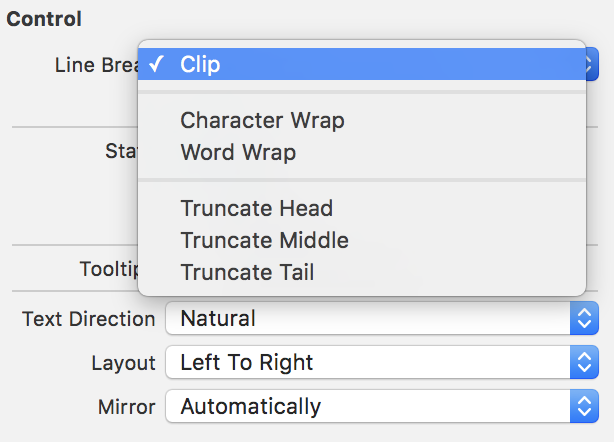 The control responsible for this functionality in macOS is NSTextField. NSTextField is used for both displaying and editing text. You’ll notice this differs from iOS, where UILabel is used to display fixed text, and UITextField for editable text. In macOS these controls are combined into one, and its behavior changes according to the value of its isEditable property. If you want a text field to be a label, you simply set its isEditable property to false. To make it behave like a text field — yup, you simply set isEditable to true! You can change this property programmatically or from Interface Builder. 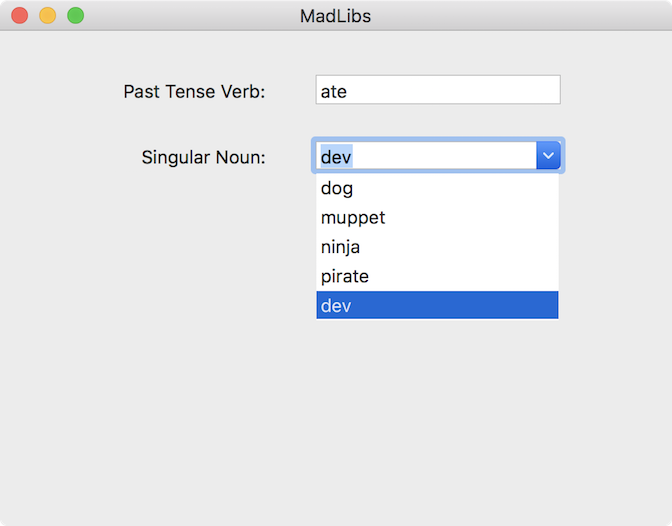 You will add various macOS controls to the MadLibs app, which will allow you to blindly construct a funny sentence. Once you’ve finished, you will combine all the different parts and display the result, hopefully with some comedic value. The more creative the you are, the more fun they’ll be! 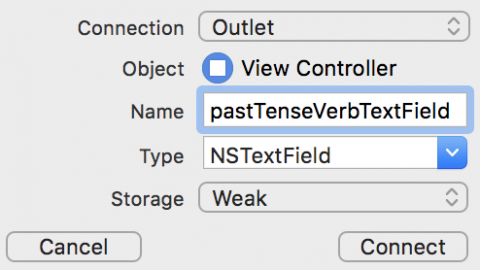 The first control you’ll add is a text field where you can enter a verb to add it to the sentence, as well as a label that informs what the text field is for. Open Main.storyboard. Locate the Label control in the Object Library and drag it onto the view in the View Controller Scene. 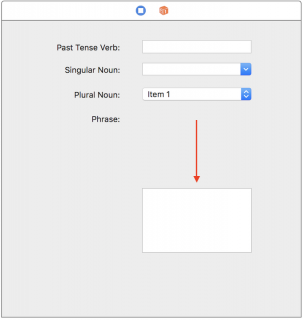 Double-click the label to edit the default text, and change it to Past Tense Verb:. In the popup window that appears, name the Outlet pastTenseVerbTextField, and click Connect. And that’s it! You now have an NSTextField property in your view controller that is connected to the text field in the main window. You know, it would be great to display some default text when the app launches to give an idea of what to put in the field. 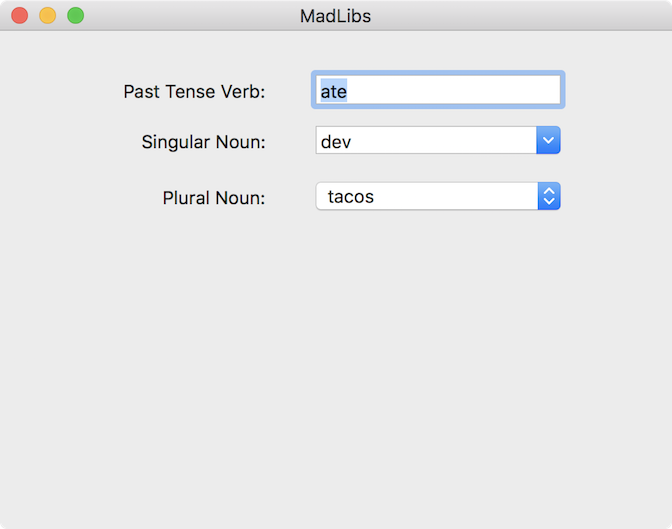 Since everyone loves to eat, and food related Mad Libs are always the most entertaining, the word ate would be a tasty choice here. A good place to put this is inside viewDidLoad(). Now, simply set the stringValue property you learned about earlier. Okay, that takes care of a single input with a default value. But what if you want to provide a list of values to select from? Combo Boxes to the rescue! A combo box is interesting — and quite handy — as it allows the user to choose one value from an array of options, as well as enter their own text. Here, the user can select from a predefined list, or enter their own server name, if they wish. The macOS control responsible for this is NSComboBox. NSComboBox has two distinct components: the text field where you can type, and the list of options which appear when the embedded button is clicked. You can control the data in both parts separately. Providing options for the list is a little more involved, but still relatively straightforward. You can call methods directly on the control to add elements in a manner similar to mutable Array, or you can use a data source — anyone with experience on iOS programming and UITableViewDataSource will feel right at home! Note: If you are not familiar with the concept of Data Sources, you can learn about it in Apple’s Delegates and Data Sources documentation. When using a data source the combo box will query the data source for the items it needs to display as well, as any necessary metadata, such as the number of items in the list. To obtain this information, you’ll need to implement the NSComboBoxDataSource protocol in one of your classes, normally the View Controller hosting the control. From there, it’s a two-step process to configure the combo box to use the data source. Note: The order of the instructions in the code above is important. An attempt to set the dataSource property when useDataSource is false (which is the default) will fail and your data source will not be used. Finally, whenever your data source changes, to update the control, just call reloadData() on the combo box. If your list of items is relatively small and you don’t expect it to change that often, adding items once to the internal list is probably the best choice. But if your list of items is large or dynamic, it can often be more efficient to handle it yourself using a data source. For this tutorial you’ll be using method 1. In this section you’ll add a combo box to enter a singular noun. You can either choose from the list or enter your own. First, add a label that describes what the control is for. Open Main.storyboard. Locate the Label control in the the Object Library palette, and drag it onto the content view. Change its alignment to Right and its title to Singular Noun:. Note: Alternatively as a shortcut, hold down the Option key and drag an existing label to duplicate it. This is handy so you can keep the same size and properties of an existing label. Locate the Combo Box control and drag it onto the content view, placing it to the right of the label. In the popup window that appears, name the outlet singularNounCombo. Now the NSComboBox property is connected to the combo box control. Next you are going to add some data to populate the list. The first line removes any items added by default. Next, it adds the names from singularNouns to the combo box using addItems(). Then, it selects the last item of the list. Build and run the application to see your combo box in action! Great — it looks as though everything is working just right. If you click on the combo box, you can then view and select any of the other items. Now, what if you wanted to present a list of choices, but not allow you to enter your own? Read on, there’s a control for that as well! The pop up button allows the user to choose from an array of options, but without giving the user the option of entering their own value in the control. The macOS control responsible for this is NSPopupButton. Pretty straightforward, isn’t it? That’s the beauty of macOS controls — there are a lot of similarities between them in terms of the methods used to manipulate the controls. You’ll now add a pop up button to your Mad Libs application to choose between different plural nouns to populate your comical sentence. Open Main.storyboard. 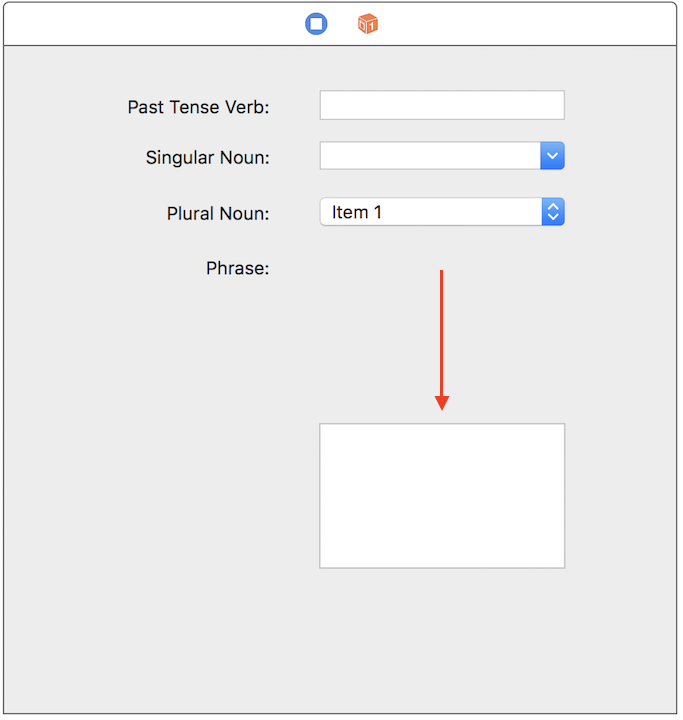 Drag a label just below the Singular Noun label. Change the alignment to Right and the title to Plural Noun:. 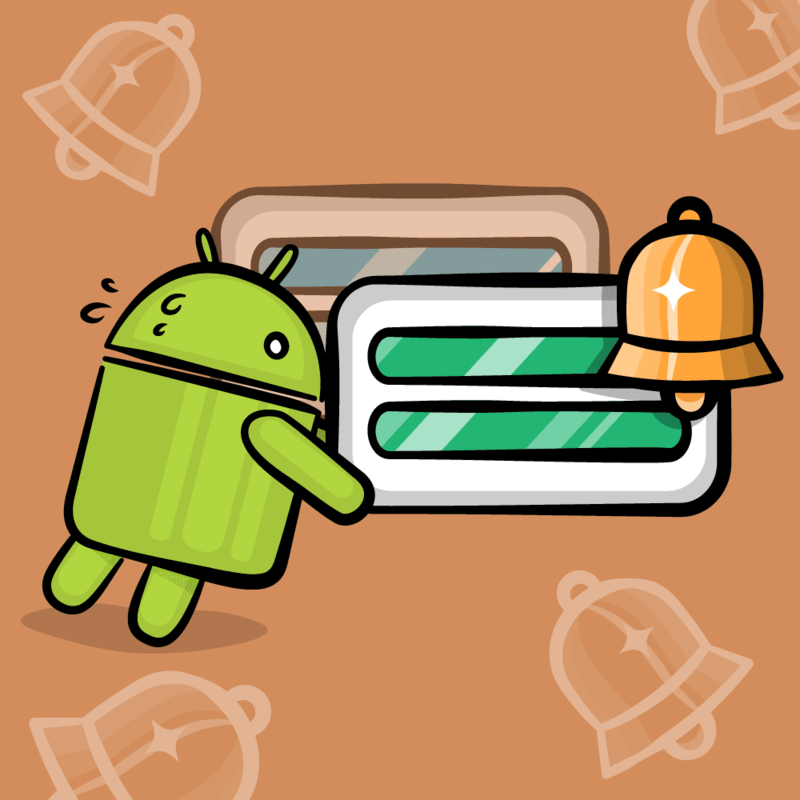 Next, locate the Pop Up Button control and drag it onto the window, placing it to the right of the label. Now you just need some data to populate the control! 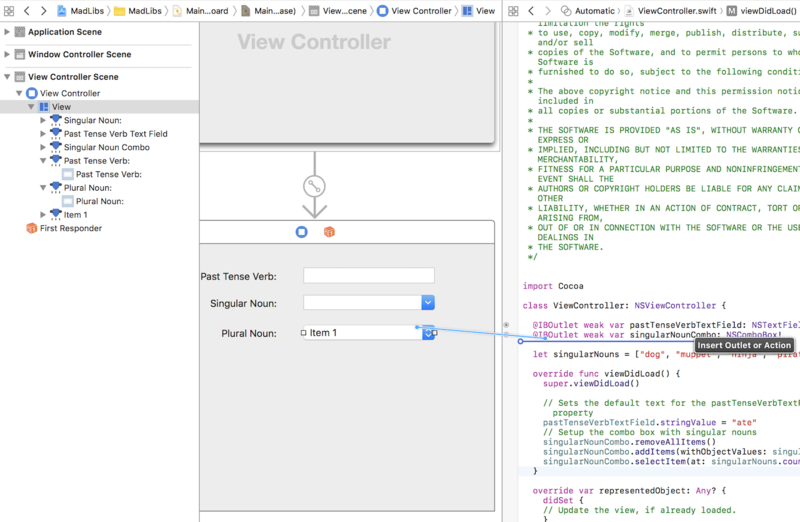 Open ViewController.swift and add this property inside the class implementation. The first line removes any existing items from the pop up button. The second line adds the array of nouns to the pop up button using addItems(). Finally, it selects the first item in the list. Once the app has launched, note that the pop up button shows the initial item, tacos, and if you click on the pop up button, you’ll see all the other items in the list. Okay, so you now have two macOS controls that allow the user to select from lists, as well as a control that allows the user to enter a single line of text. But what if you need to type more than a few words in a text field? 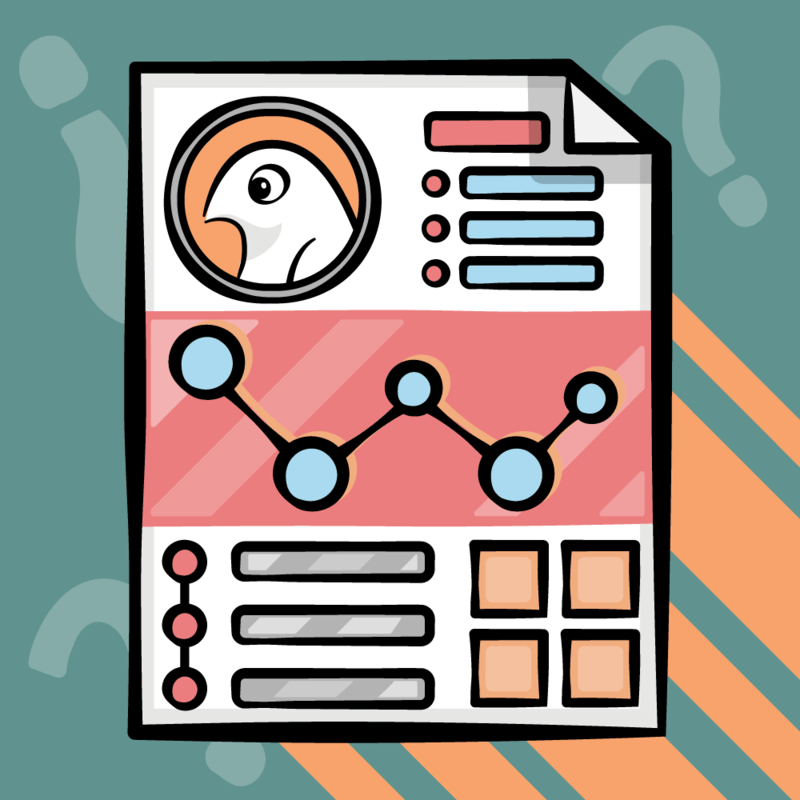 Read on to learn about text views! 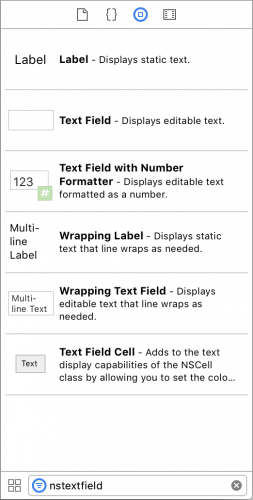 Text views, unlike text fields, are usually the control of choice for displaying rich text. Some implementations even allow for more advanced features such as displaying inline images. The macOS Control responsible for this is NSTextView. myTextView.string = "Text views rock too!" Relatively simple — nothing too shocking here. NSTextView also has built-in support for NSAttributedString. If you pass an attributed string to a text view, the string will be displayed correctly using all the appropriate attributes such as font, font size, and font color. Note: An attributed string is a special type of string where you can tag subsets of the string with different attributes – such as its font, its color, whether its bolded, and so on. To learn all about attributed strings, check out our TextKit Tutorial. It’s an iOS tutorial, but the information about NSAttributedString applies to Mac development as well. 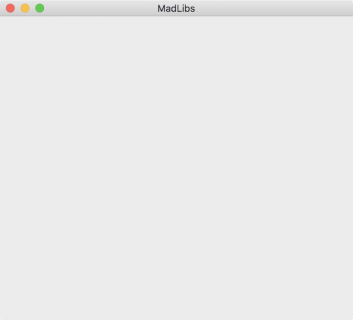 Looks like you have everything you need in order to add a text view to your Mad Libs application! 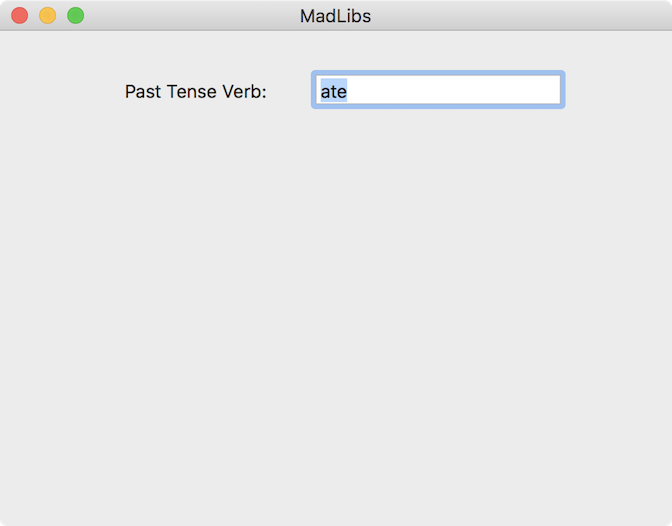 This text view will allow the user to enter a multi-word phrase that will be used in the final rendered Mad Lib. 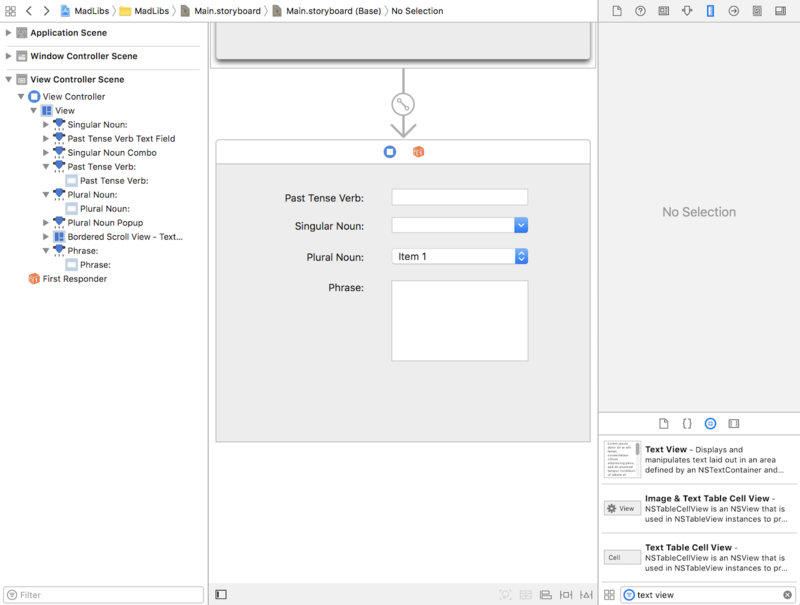 Open Main.storyboard and drag a label just below the Plural Noun label (or duplicate an existing label, as mentioned earlier). Change its alignment to Right and its title to Phrase:. Next, locate the Text View control and drag it onto the window, placing it beside the label you just created. Now, if you try to resize the view and make it taller, you’ll notice something quite particular. The text view moves along, and changes its position when you resize the window. That’s because by default, Xcode adds Auto resizing constraints to the text view, so that it repositions itself when its parent view is resized. Since you want the text view to stay put, you’ll need to disable some of those. Select the Bordered Scroll View – Text View from the Document Outline and go to the Size Inspector. Now, the text view stays put and aligned with the label even if you resize the window. Next, add an NSTextView outlet to the view controller. Select the textview, open the Assistant editor and make sure ViewController.swift is selected. 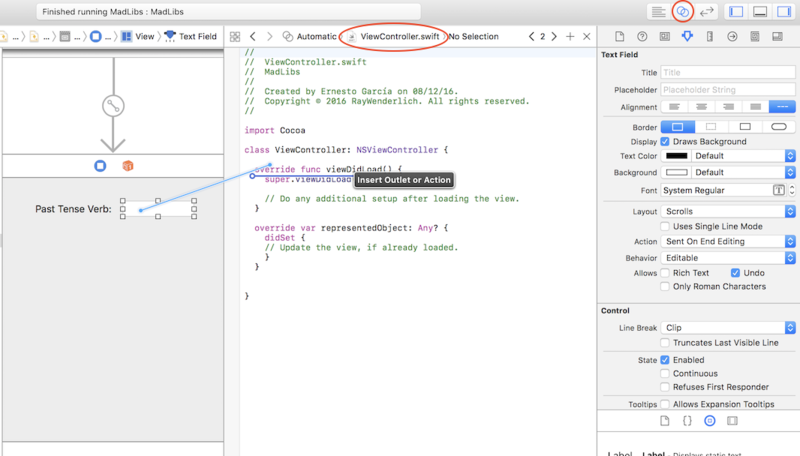 Ctrl-Drag from the text view to the ViewController class under the existing outlets. Important: Text views are contained inside scroll views. It’s important you make sure you’ve actually selected the text view before creating the outlet. To do so, simply click three times on the text view or select it in the Document Outline. 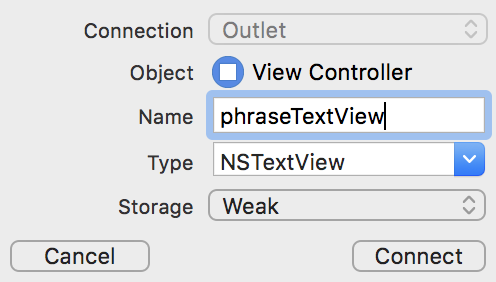 In the popup window, make sure the type is NSTextView, and name the outlet phraseTextView. 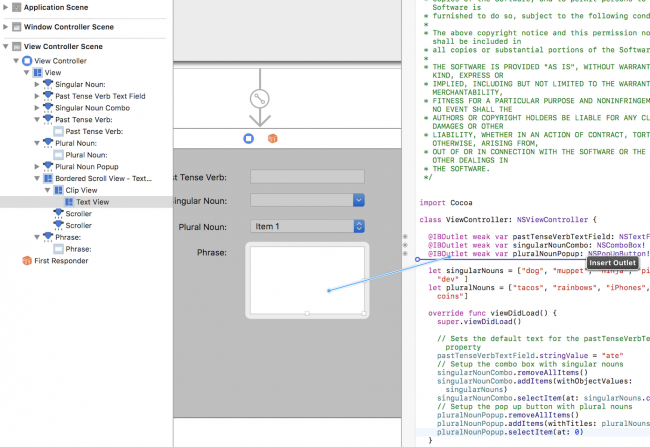 phraseTextView.string = "Me coding Mac Apps!!!" Superb! The Mad Libs application is really starting to take shape now. Buttons are macOS controls designed to send a message to the app whenever they’re clicked. The control responsible for this on macOS is NSButton. There are many different styles of buttons (you can view them in Interface Builder’s Object Library). They all work in much the same way, the only difference being their visual representation. 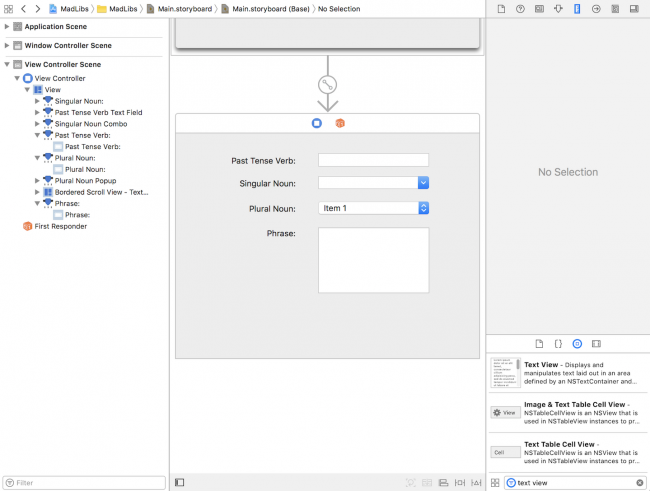 You should use the style of button that best suits your application’s design — refer to the macOS Human Interface Guidelines for advice and guidance on best design practices for your app. Looks fairly simple — adding a button to your app in the next section should be a breeze. Open the Assistant Editor and Ctrl+Drag from the button to the ViewController implementation. In the popup window that appears, make sure that the connection is set to Action. Name the action goButtonClicked. Whenever the user clicks on the button the action method goButtonClicked() will be called. For now you’ll add some debug code, just to make sure everything’s working. let phrase = phraseTextView.string ?? "" 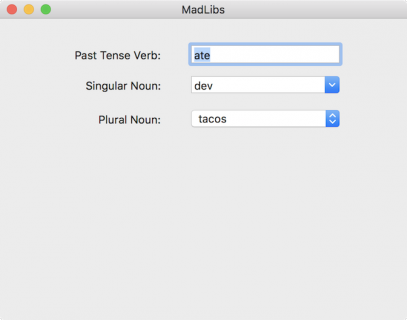 let madLibSentence = "A \(singularNoun) \(pastTenseVerb) \(pluralNoun) and said, \(phrase)!" This code gets the strings from the text field, the combo box, the popup button and the text view and forms the Mad Lib sentence. Note that for the text view, the string property is actually an optional, so it could be nil. To guard against that case, you’re using the nil coalescing operator ?? so if string is nil, you’ll get the empty string "" instead. That’s all the code you need for now — build and run your app. 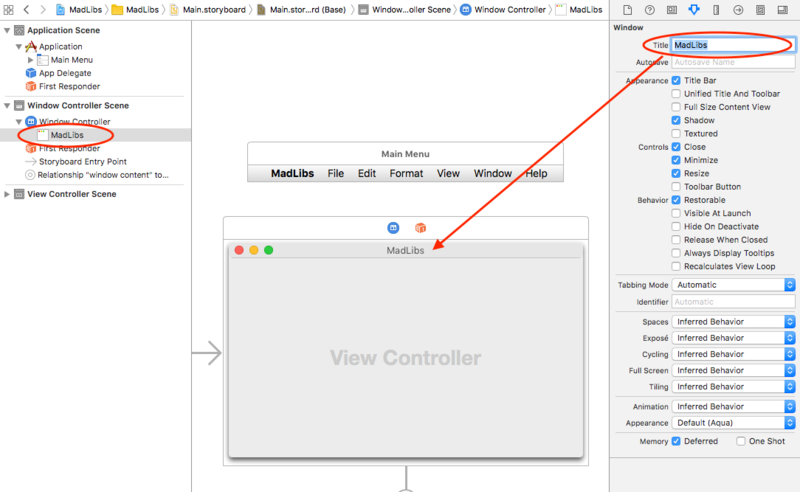 Every time you click the button, you should see a short and silly sentence appear in Xcode’s console. 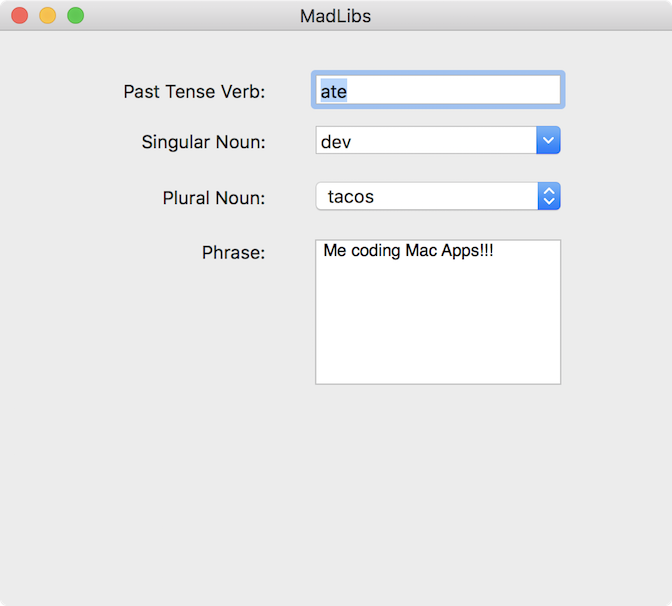 A dev ate tacos and said: Me coding Mac Apps!!!! That’s great, but how could you make it even funnier? How about making your computer read the sentence? Steve Jobs made the first Macintosh say hello to the world in its presentation. You can make your computer talk too… Let’s get at it! First, you declare an enum to represent the voice rate. Then you create and instance of NSSpeechSynthesizer which is the class that will convert the text to speech. This method starts the synth object speaking a string at the determined speed. Build and run; click Go! and listen to your Mac saying your sentence out loud! You can the download the final project containing all the source code from this tutorial up to this point. In the second part of this tutorial, you’ll learn about more macOS controls, including sliders, date pickers, radio buttons, check boxes and image views — each of which will be added to your Mad Libs application in order to complete it. 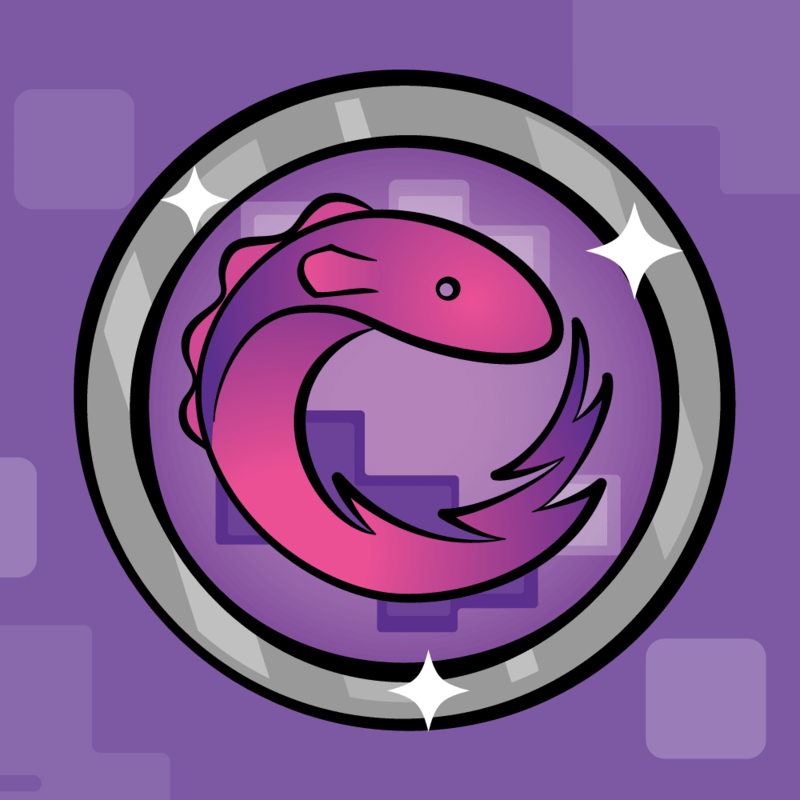 In the meantime, if you have any questions or comments about what you’ve done so far, join in the forum discussion below!